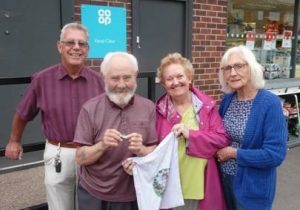 The latest monthly draw of the Werrington Lottery was made by Basil Turner who was born in Werrington and is well known in the village. Winning number 63. Organised by the Werrington Community Volunteers Group the lottery raises funds for a wide range of community activities including Werrington in Bloom, Free full colour Village Life community magazine, www.myvillagelifeonline.com community website, Community E-News information service, Jubilee Garden Project, Village Seating, Neighbourhood Watch, Village Life Radio Show, Free media promotion service for local groups, Poppy planting around the village, Residents Consultation Evening and concert, Christmas Trees with community switch-on, Road Safety & Safe Parking campaign for Primary school, provided an Edible Garden for the Primary school. Poppy Man & Windmill projects with British Legion. You have to be in it to win it and if you would like to know more about the Werrington Lottery which raises funds for village projects call 01782 303192. Our photograph shows Community Volunteers Chris Lewis with Basil, Lottery Organiser Jocelyn Morrison and Jean Fryer.